Holy Week began with our Palm Sunday service which included the distribution of palm crosses by the children of Junior Worship to all those present. The last of our Lenten Study luncheons was held today, Tuesday, on the theme of the destruction and rebuilding of the temple - made more poignant by the news of the fire at the cathedral of Notre Dame de Paris. This successful series of discussions had been made all the more enjoyable by the combination of the theology & philosophy - provided by Tim & Jenny - and and the food, catered by Denise, Sue and Chris. Tomorrow, Wednesday, is the Church AGM at 7.300 pm. We then look forward to our services on Maundy Thursday evening, on Good Friday morning at St Stephen's and on Easter Sunday morning for communion. For details of them all, please see our Easter page. Looking back over the past week, what a time we have had. On Friday morning, 5th, we had our monthly Open Doors Coffee Morning as usual. We welcomed many friends and started our final push towards the Spring Fair. The Spring Fair was a great social success for old and young alike with an amazing number of visitors from near and far. Beside our usual stalls there was a pets' corner, bouncy castle, face painting and supervised children's craft activities which were all a huge success for our young visitors. The £1 admission included tea/coffee and scones with strawberries. A bargain in itself. Some pictures are here. And on Thursday afternoon this week we held our first afternoon Tea Dance. Some enthusiastic dancers joined in with ballroom, Latin and jive numbers, whilst others were content with just a shuffle round our new floor. Sandwiches and cake were included and all for £1. A promising start to what it is hoped may become a regular, monthly event. Watch this space and see our Pictures page for a few shots of the action. Thanks go to all who helped prepare, and who attended, these three events this week. Another tremendous weekend at Allerton. On Friday evening our Sea Scout troop retained its accreditation as a Royal Naval recognised unit, following an inspection by a Royal Navy Lt Commander. On Saturday afternoon we hosted a pop-up market fundraiser for the Bentley Operatic Society and on Saturday evening the Phoenix Concert Orchestra and friends played to a packed house of 240 people who enjoyed a marvelous concert of film- and show-tunes hosted by their excellent MC and very talented musical comedy performer Lord Julian Goodman. The huge audience and all the 50-odd performers were treated to interval refreshments by our hardworking team led by Denise and Sue - with all hands being required for the transformation ready for our Mothering Sunday service next morning. How we could have done with an extra hour in bed - never mind an hour less!! This week we started our Lenten Luncheon series when 18 friends joined together on Tuesday for a simple lunch and some discussion based around a short film clip from The Godfather and two Bible passages. We are also, now, looking forward to a couple of fundraising events coming up. On 30th March we have a Spring concert by the Phoenix Orchestra - A Soundtrack of My Life - featuring tunes from the musicals. Then, on Saturday, 6th April at 2.00 pm we have our annual Spring Fair, this year in the sanctuary. There will be all the usual stall as well as refreshments. See the church magazine, the church noticeboard or the What's On page for details of both events. 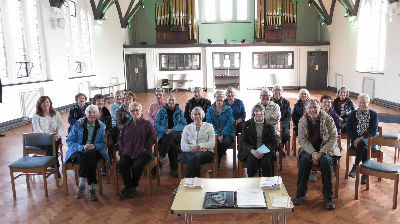 Last Monday, we welcomed the Churches Together In Mossley Hill walking group. After their morning walk and visit to Sudley House, they joined us for their lunch in our lounge. They were then addressed by Minister Tim regarding the church's vision, given an illustrated PowerPoint talk from one of our Elders and taken on an accompanied tour of the premises with several of our members - which gave rise to some lively discussion. This is a copy of the leaflet we have been distributing around the neighbourhood to bring the good news of all we do at our church. If you are outside our area or have not had one delivered yet, you may read a large version by hovering the cursor above the 'n' in 'Allerton'. Click on the cross arrows symbol and it should pop out. Last Saturday evening and Sunday afternoon RADS put on a Variety Theatre Dinner / Afternoon Tea in the form of a series of comic sketches with food. Both occasions were a sell-out and the entertainment was first class - we had everything from saxophone solos, Joyce Grenfell soliloquies, the "Two Ronnies", Monty Python, Mr Bean, Victoria Wood's hilarious "Let's Do It", Pam Ayres' poetry, a bit of Shirley Valentine and even an Alan Aykbourn playlet. Compered, Leonard Sachs-style, the show finished with a rousing rendition of Waltzing Matilda, led by an Aussie, Crocodile Dundee's "brother", and the whole cast - but mostly "YOURSELVES!" The food on both occasions was prepared and served by Denise, Jenny and Sue and their intrepid team of helpers and the thanks of everyone present go to all involved in two tremendous shows. 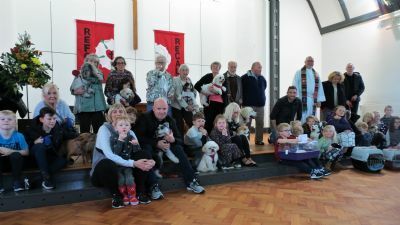 Sunday, 21st October was our Blessing of the Animals service, which was again a great success. Pets, but mostly dogs of all shapes and sizes, included a cat, rabbits, guinea pigs and even a couple of large, cuddly stuffed toys and all received a certificate and a blessing from the Minister, Tim. "All creatures, great and small" were very well behaved and their owners, from a very wide age range indeed, went home happy and content that their beloved pets had been recognised for the happiness they bring. Please see more pictures on the Photos page. Our Quiz Night on Saturday evening was a great success with fifteen teams taking part. More than 80 church members, friends and neighbours packed the hall and joined in the fun. Chris (Jones) produced eight engaging rounds, a very entertaining Nursery Rhyme competition and a fabulous picture gallery round in full colour - all of which kept the teams challenged, amused and enthralled throughout the evening. In a nail-biting finale, only three points separated the three leading teams in a high-scoring contest enjoyed by all. See you all at our next one. Watch this space. Our MacMillan Coffee Morning was a great success with around 60 people in attendance on a fine morning to enjoy our delicious array of home-made cakes and biscuits. Including the table sale and book stall, donations amounted to £600 for this very worthy cause. Thank you to all who arranged it and attended. Our Festive Soiree open house evening of gratitude was to acknowledge the work that had gone on over the past year to refurbish our Church Sanctuary. There was singing from from minister Tim (solo) and from the Allerton Singers chamber choir; organ and piano pieces from two of our regular organists, Paul and Oliver; poetry from our minister Tim and elder Nick; a tribute from Tim to all who had played any part at all in the work to refurbish the premises and a huge cry of "Thank You" from all present. A pleasant, if unusual, evening of entertainment and refreshments. The Christian Aid Circle the City 2018 sponsored walk - 10k - started this year from All Hallows church at 10.00 am and finished at ours, from 1.00 until 3:30 pm. All 40 walkers were greeted with a cuppa and refreshments and were given a guided tour of the premises and a potted history of the church. They were all enchanted by our refurbishment work and the lovely, bright appearance of our sanctuary. Friday night was the annual visit to our, 4th Allerton, Sea Scout troup by Royal Navy Commander Richard Bone. He saw the lads put through their paces with a parade and inspection followed by lessons on map and compass work, survival, lifeline heaving and a lesson on anchorages. It was not all work though, with short sessions of basketball and deck hockey to liven things up. Two senior scouts were presented with their Chief Scout's Gold Challenge Awards - Christopher McCarthy and Cameron Ward; Sam Wilde being unable to attend. 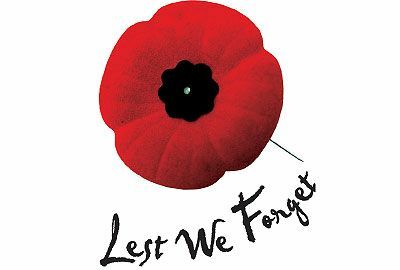 An address by Commander Bone was followed by the breaking of colours and prayers before dismissal and an informal buffet supper with parents and supporters.You may see photos of the event on our PHOTOS page. 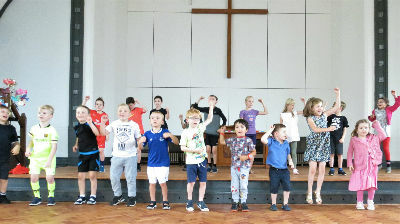 What an amazing final session for our Summer Holiday Club today! A very happy band of boys and girls were treated to a whole host of fun activities. They made animal face masks, decorated plates with edible rainbows, learned to draw their hands - in 3D! - and made a volcanic eruption (outdoors, parents!) using a full 2 litre bottle of Cola and a tube of Mentos. After a healthy lunch, and a lively session of parachute-tossing of coloured balls, they gave a concert in the sanctuary to their parents, carers and family members. There were three action songs and a very spirited version of the Hokey-cokey where everyone joined in - except it was the Holy-Cokey with appropriated words of praise. The whole Holiday Club closed with a prayer from Tim, the presentation of certificates to all the children and a vote of thanks to each individual who had contributed so much hard work before, during and after a very, very successful Summer Holiday Club 2018. Take a look at more pictures on our Photos page.